We’ve been hard at it getting our new kit to market, first one is going to Paris France, ordered sight unseen, pre-paid, by a fellow who bought one of our adobe chapel kits. He said this kit will be the “masterpiece of my layout”. Julie’s Cantina & Dance Hall is our newest kit, just released! Available in HO, S & O scales, it is our most realistic adobe kit yet! It features about 20% of the adobe surface eroded away to reveal the adobe bricks. Construction involves a plywood substrate, then fracturing our Hydrocal casting of 400 square feet of adobe brick into shards, gluing the shards to the substrate, then finishing the rest of the wall surface to a grade above the adobe brick. Also included are the outhouse (bano), Indian bread oven (horno) and an 18′ bar & bar stools. Visit our web site for more details & photos, www.modelrailroadkit.com. We sold one of our chapel kits to a fellow in France this week, and took an order for a kit we plan to release in February for a roundhouse (photo attached) to someone in Zurich Switzerland. The roundhouse took over 500 hours, we developed our own freelance design, and drew plans on the CAD program and wrote rough draft instructions included in those hours. Tom,Dean & Dean,who built the Housing Development on the north side of El Granada,also built the Shore Bird,probably in 1972 or early 1973.I’m thinking that Westinghouse bought the Housing development and the “Bird” in 1974.I remember,because ,Westinghouse was Firing the entire staff shortly after that ,and we had a”Humungous” “ Meal-all the “Locals showed up the last night,and the Staff kept bringing free plates of Crab Legs and Pitchers of Wine all night.We paid a small bill;and left a huge tip. Farris,in Hawaii,and see if he has any photos of the Shore Bird he can E- mail to you. I chanced on your web site while trying to find information on the Shorebird’s origins. I read a bit about you seeing Jack King at El Granada Hardware when I owned it. I married Cheryl Parsons in 1968, but my name is Andersen, not Parsons. I can see the confusion, as I employed Cheryl’s brothers, Mark, Brent & John Parsons at various times through the years at El Granada Hardware. I first met you when I was just getting into riding waves, and John Morrall wanted to teach me to ride a surfboard at the El Granada Jetty. I was riding Boogie Boards. On a day of particularly good surf, we hooked up & paddled out at the Jetty, John, myself, and you. You and I were the novices, and relegated to just watching John & the other capable surfers have a great session. I went on to open a hardware store in Santa Cruz in 1980 to follow my passion for riding waves. I advanced in the Boogie Boarding pretty quickly, making several trips to the islands riding some serious Hawaiian surf, and in 1984, won the Boogie Board contest at Steamer Lane for men’s age 30 & over division. In 1981 I learned to ride stand up surfboards at Pleasure Point in Santa Cruz, and by 1985 was riding 25′ wave face surf at Steamer Lane in SC on a 7’2″ board I had made to my specifications. I surfed avidly for nearly 30 years. In the mid-1990s I traveled to Kauai and went surfing with John & his daughter, and John dropped off & picked up myself and my then girlfriend for a back packing trip into Kalalau along the Na Pali coast. to market, and Julie wants to market a kit depicting the original Shorebird. If you know of any photos we would love to get them. We can create the model kits from photos. 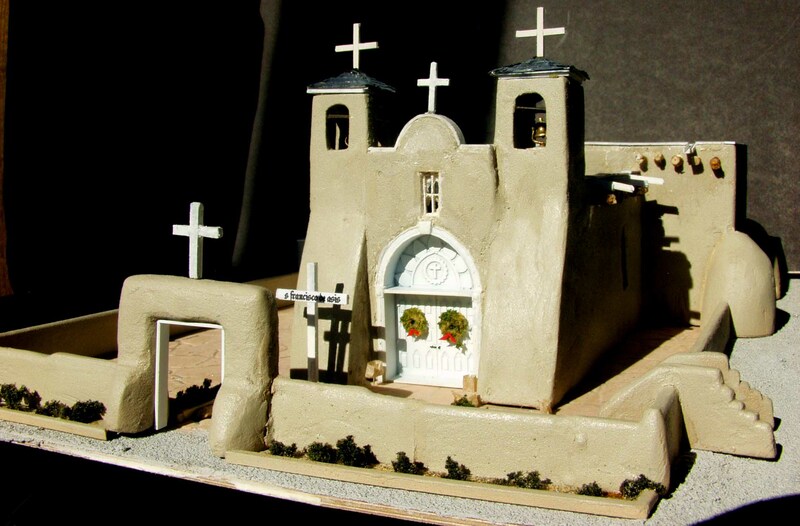 The church in Taos on the web site was done from photos. Anyhow, sure glad to find your site. I remember Jack King fondly, one of my favorite people to come in the store, as certainly was yourself.